Microsoft OneNote is an app for you to jot down quick notes or store research information. It's one of a small genre of software applications that includes Evernote, DEVONthink and Apple Notes. .
OneNote is up there with the best of them in nearly every way — but there are few missteps and annoyances too. Nonetheless, Microsoft OneNote has fans and you might well become one of them. It's got an importer to help Evernote users switch allegiances, and that might apply to you, too. OneNote is packed with excellent features and it almost deserves the near-universal praise that gets heaped upon it. There are problems that mean we can't just stop writing with this paragraph, and tell you OneNote will sort out your life. They're all problems, though, that are less of an issue the more you use the whole of the Microsoft Office suite. If you're a regular Word user, then OneNote slots into your work life superbly. Say you're in the middle of writing an academic paper in Word and you suddenly think of something else you'd far rather be doing or somewhere else you'd far rather be. You could add "Book vacation" into your Outlook task manager — but you could also jot down a note about it in OneNote. With OneNote, you could have a note in which you just start adding thoughts about where you want to go and how many days until you can get out of this office. Then you go right back to work until your partner emails you a link to a website about holidays. Save that into the same note to look at later. Given that you're a workaholic, you could also sneakily save a copy of your paper into OneNote so that it's with you on the beach. That's what OneNote is for: jotting down thoughts and building up a repository of useful information that you can access anywhere. Whatever power notes app you use, the odds are gigantic that you will make temporary notes by the thousand. You'll also, though, make notes that form the center of your next academic paper, your next report, your next stand-up comedy gig. Power note apps need to cope with both. They have to make jotting something down be very fast and then finding that note later to be very quick. They need to help you organize things so that next to that note with your partner's website link you can have one that contains PDF brochures from travel agents. OneNote does all of this but it does it best when you're using Microsoft Office. That's both in the sense that it fits in with apps like Word but also in the literal meaning. While you are actually working in Office, actually writing in Word, then OneNote is probably your best choice. It could be better: it would be great to be able to save a Word document or a section of it to OneNote without leaving the word processor. As it stands, you have to save your document as you normally would and then drag the file into OneNote. Once you step outside Office, OneNote loses more of its appeal. To make a note now, you have to first launch the app and while that sounds obvious and necessary, OneNote rivals don't need it. DEVONthink has its Sorter, which with a keystroke will pop up a window for you make a note in immediately. Evernote has its menubar app which is just a simple empty note that again is called up with a keystroke. Nicely, Evernote's version lets you open and close that simple note over and over to add things during the day. Whenever you decide you're done, one click and it's all saved for you. There's a convenience there but it's also about just how fast you can get something down. Consequently, unless you happen to have OneNote open, it's not the best for those times when someone phones you or a stray idea pops into your head. It is better at this on iOS than it is on Mac, though. 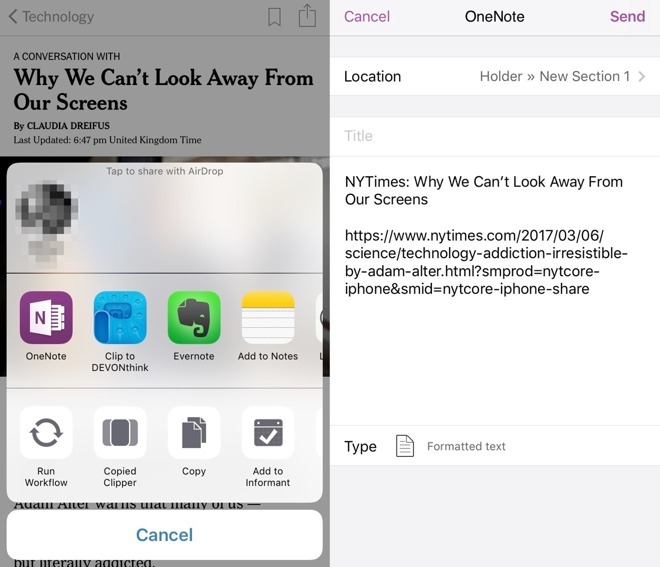 On your iPhone or iPad you could write a note in just about any app and then using Apple's Share Extensions, save it into OneNote. This is the opposite of what happens on the Mac: here you do stay within Word and send the text over. Only, say you wrote that note during a meeting and you're the one who's been lumbered with writing up the minutes, you're the one who's been landed with a lot of tasks. What you're most likely to want to do is now open the meeting notes in OneNote and write a new document for the minutes. Possibly, you also want to make notes on your own tasks but really the odds are that you want to see the notes and to write a new one. You can't do that in OneNote on the Mac or iOS. You can move very quickly between notes through a Safari-like tab system but you can't see two at the same time. Similarly, it's also as if Microsoft is also expecting you to solely work on your most recent notes. That's fair: ask any Evernote user and they probably have thousands of notes they will never need again. Equally, they will definitely have a few that they are in and out of all this week. Only, one giant benefit of power note apps is that you should be able to find anything you ever put into them. You should be able to find it and find it very quickly. Yet again, if you are in OneNote and specifically if you are in it on your Mac, you're fine. Searching works well and you can quickly lay your hands on just about anything. You can do that without having to think about which notebook you may have popped the note into. On iOS, really you have to know where you put something before you can get to it again. The problem comes from how all power note apps have to cope with the fact you have less room on your iOS devices than you do on your Mac. They all have to show you everything but rather than all of them copying every note around to every device you've got, they compromise. Typically, a power note app may appear to have every note on your device that you've ever created but actually it's just got the title. If you want to open a note that isn't physically on your device, the app then fetches it for you. That takes a heartbeat longer than opening a document you've got, at least so long as you've got an internet connection, so it's a smart enough compromise. Evernote handles it the best: it just does it. 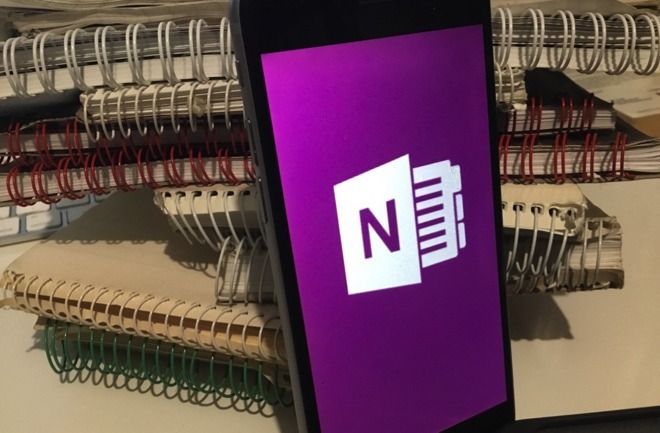 Open OneNote on your iPhone and there will be a list of recently-used notebooks. If the note you're sure you wrote once about something is in one of those notebooks, you're fine. If the note you're looking for isn't a recent one, you have to tell OneNote to search further. There's a More Notebooks button at the end of the results list and when you tap that, it looks for a few more notebooks. First it again finds your recent ones, then after a beat it lists a few more —but it's still not everything. To make it sync all your notebooks and therefore find the note you're after, you have to tap yet another button, this one marked Open More from OneDrive. Only, two or three times we had that famous error which really just needs no introduction if you're Microsoft-adjacent: OxE410640. The full error dialog says there has been a problem syncing and that this is error number OxE410640. You would like more detail but you also assume that the error means something so you look it up. However, what Microsoft means by adding "Error number OxE410640" at the end of a warning dialog box is not that this is a clue to how you can solve the problem —it's saying "by the way, in case you were wondering, we like to call this problem OxE410640." So you can do a search on the terms OneNote and OxEwhatever, but all you learn from Microsoft support is that the error message means you've got a syncing problem. Every time this happened to us, though, tapping the Sync Now button that's right there in the error message dialog solved the problem immediately. Somehow. It's little things like this that remind you you're working in a Microsoft application. These are better designed today than they have ever been, and you can easily argue that they are better on the iPad than they are on PCs or Macs. However, the DNA is the same and Microsoft still has the tick box mentality where they can say an app has a feature even if it doesn't quite work. 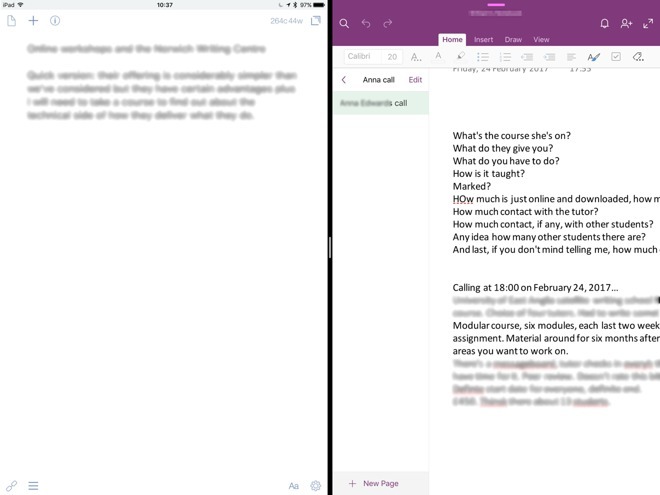 Take OneNote's implementation of iOS's Split Screen. It does it, so check it off the list. You can have OneNote open on one side of your iPad Pro screen and another app on the other. So you could, for instance, write up your minutes in Word while reading the notes you took in OneNote. 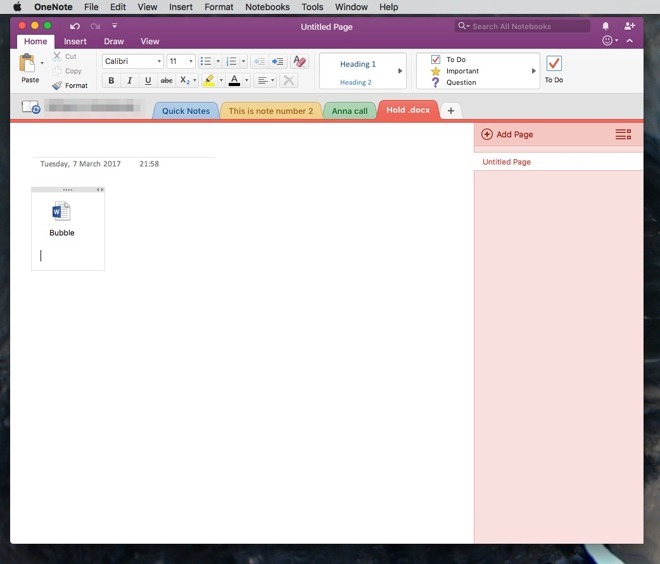 Except, OneNote doesn't recognize that the screen is narrower than it was. A lot of empty space is taken up by a navigation bar on the left of a note and not enough room is left for actual text. OneNote should know what width is available and wrap your text to fit in accordance with Apple's guidelines and APIs, but it doesn't. 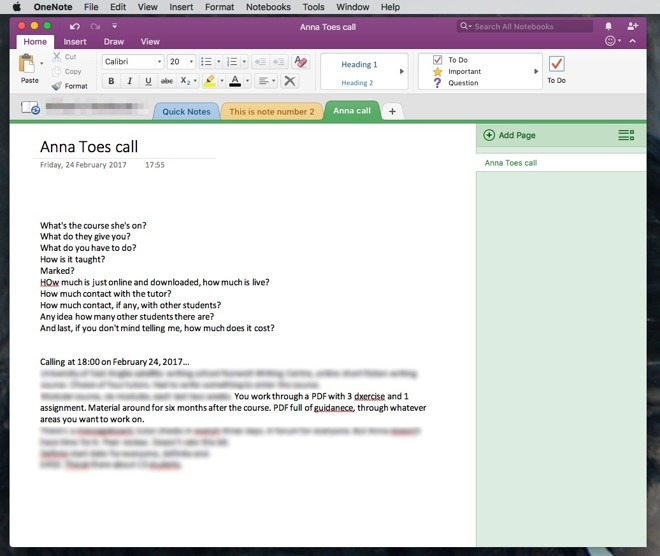 When we were writing up minutes in Word while reading from the notes we made in OneNote, we had to keep dragging OneNote out of Split Screen. It's an unnecessary problem that surely can be addressed. A boon that probably won't be is how you have to use OneDrive with OneNote. Making this work with Dropbox would be handy. Having it sync over iCloud would make it work better. Yet if all of this is enough that we can't recommend OneNote outright, if all of this is enough that we aren't drawn to it ourselves, none of it is enough to stop Office users. The integration with Word, the ability to at least send information back and forth even if you can't work on it in two places, is very well done, and fully worth the toll you pay with some of the other problems. While OneNote is part of Office 365, you just need a free Microsoft account to use it. Microsoft OneNote 15.32 requires OS X 10.10 or higher and is free on the Mac App Store. 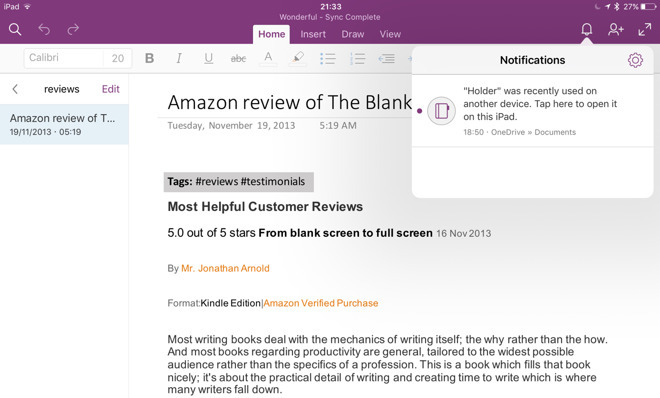 Then for iPhone and iPad, Microsoft OneNote 15.31 requires iOS 9.0 or higher and and is also free on the App Store.